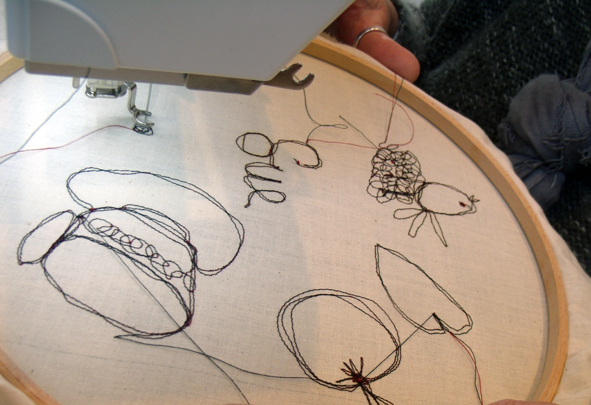 “Taking a line for a dance” is a good way to describe what happens with free machine embroidery…the freedom with which the needle can stitch patterns, images and even writing very fast – is really fascinating to watch. 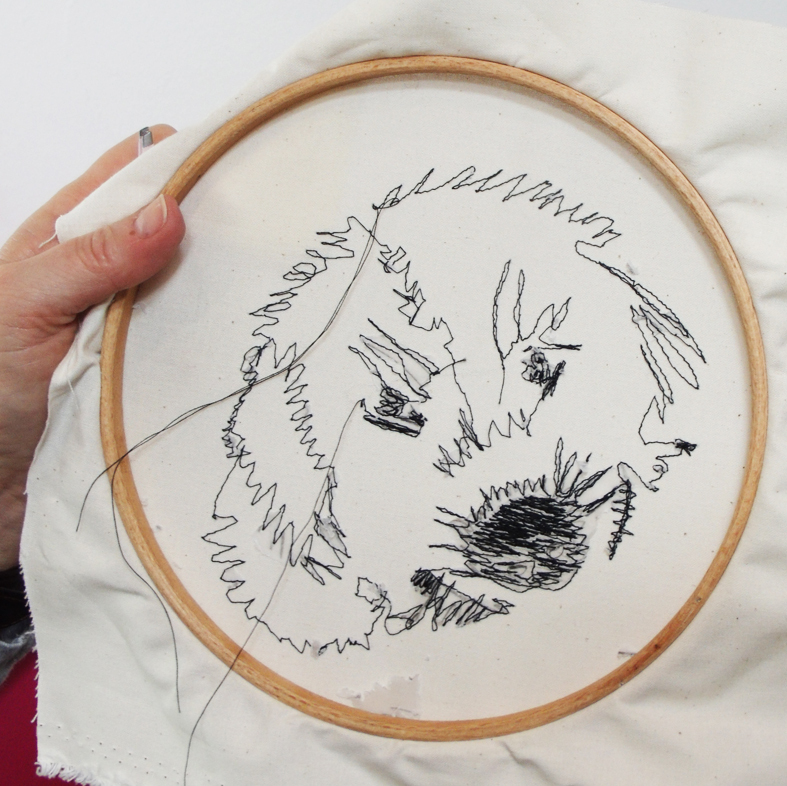 First disengage the feed dog – I just love that name for the row of teeth embedded in the metal plate below the needle…. 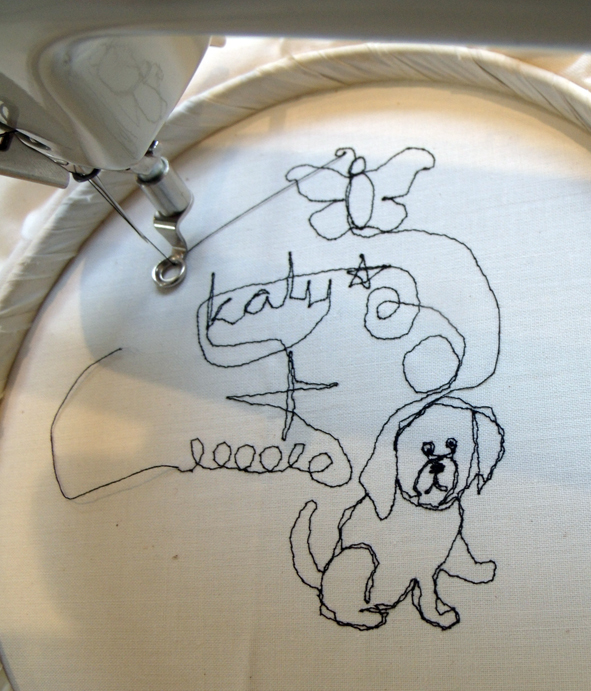 and either using a specially sprung embroidery needle, with or without the old school embroidery hoop to keep the fabric tight, it is possible to move the fabric enabling the still needle to make lines of stitches. 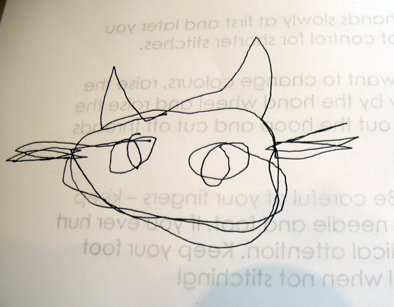 moving page animal drawing – dog or cat? 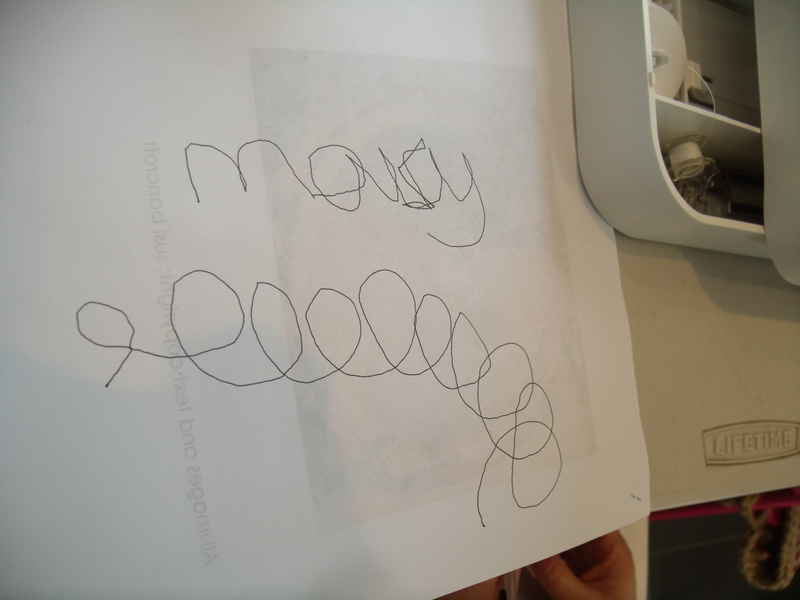 The first attempts at machining were definitely stronger than the pencil drawings. 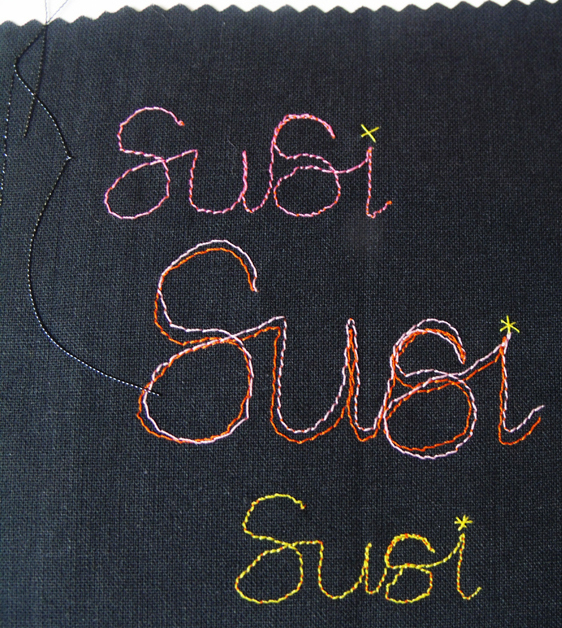 Susi always gets everyone to stitch in black cotton on white calico first, to gain a strong contrasting line..
One of the exercises offered was to copy a black and white drawing a drawing – with remarkable results considering no guide lines had been drawn beforehand. 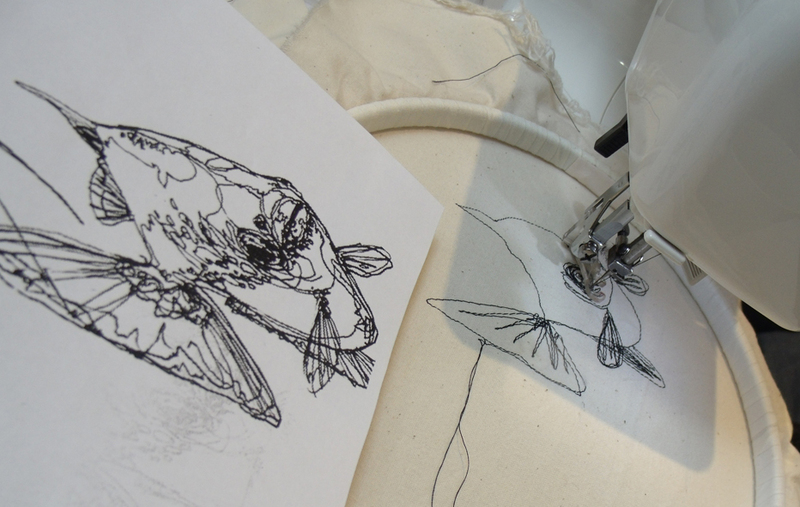 copying a line drawing of a fish – a free embroidery challenge. 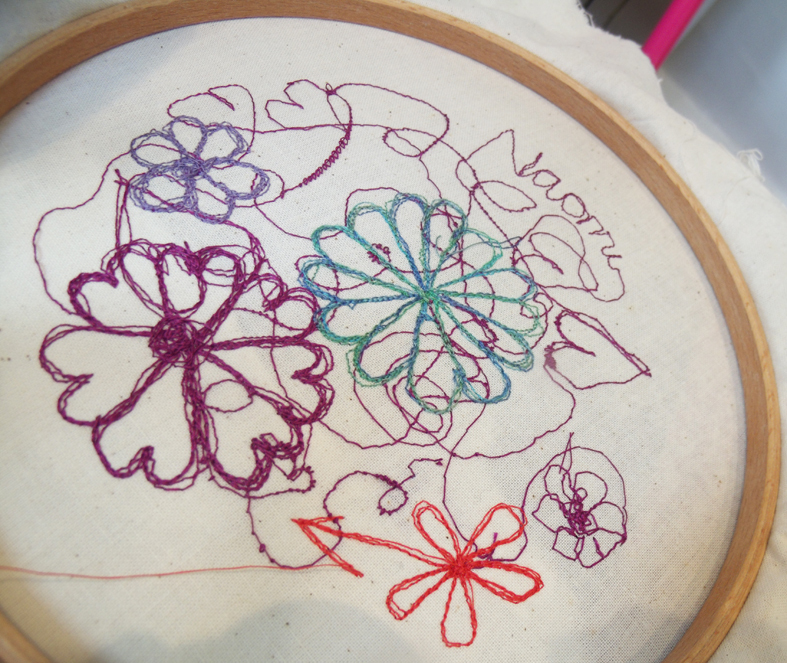 Now the colour started to be sampled, this is where all textile people get excited – endless possibilities just by changing the thread …. 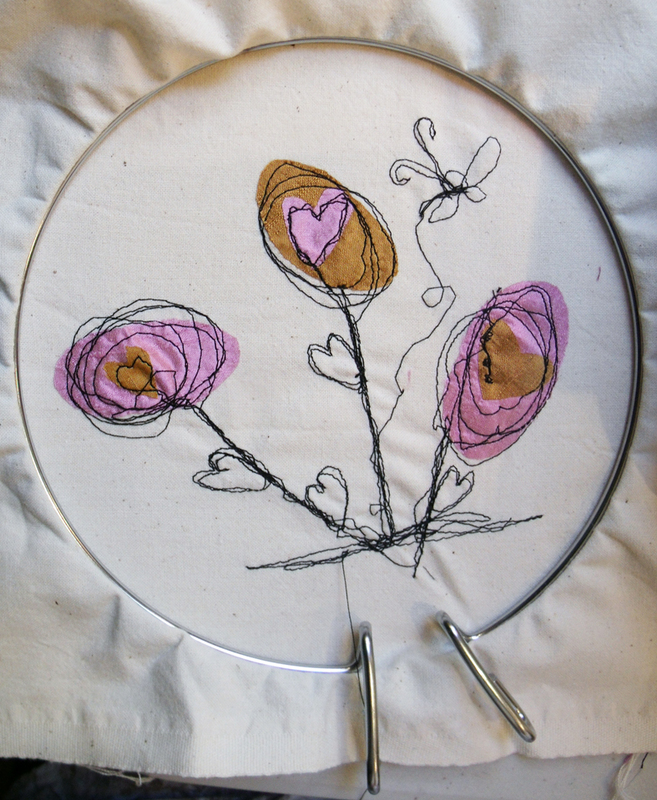 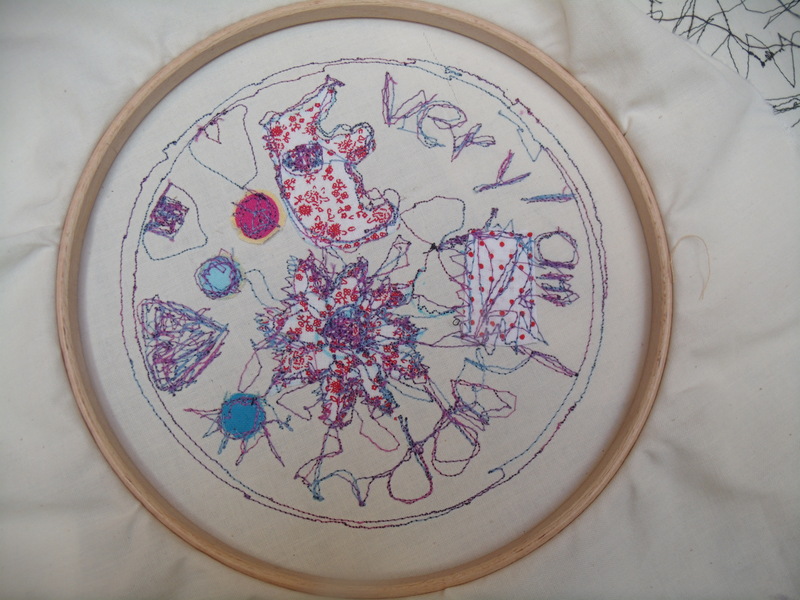 circular embroidery made by keeping to frame restrictions. 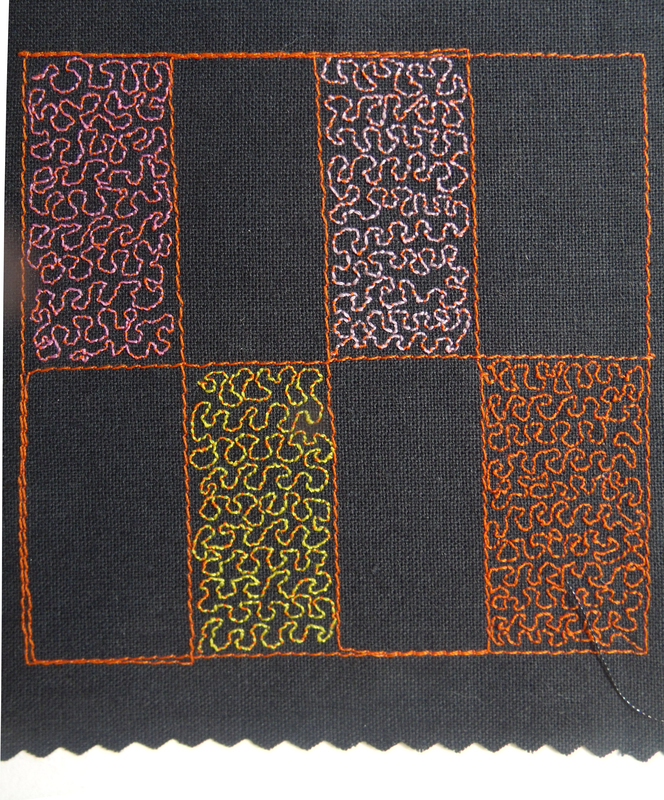 and here the nuisance of not being able to manouvre the stitching past the hoops intrusive clamps has made a new design from the original card – go with the flow…..
design due to the constricting clamps – this is what sampling is all about – work with what you have got. 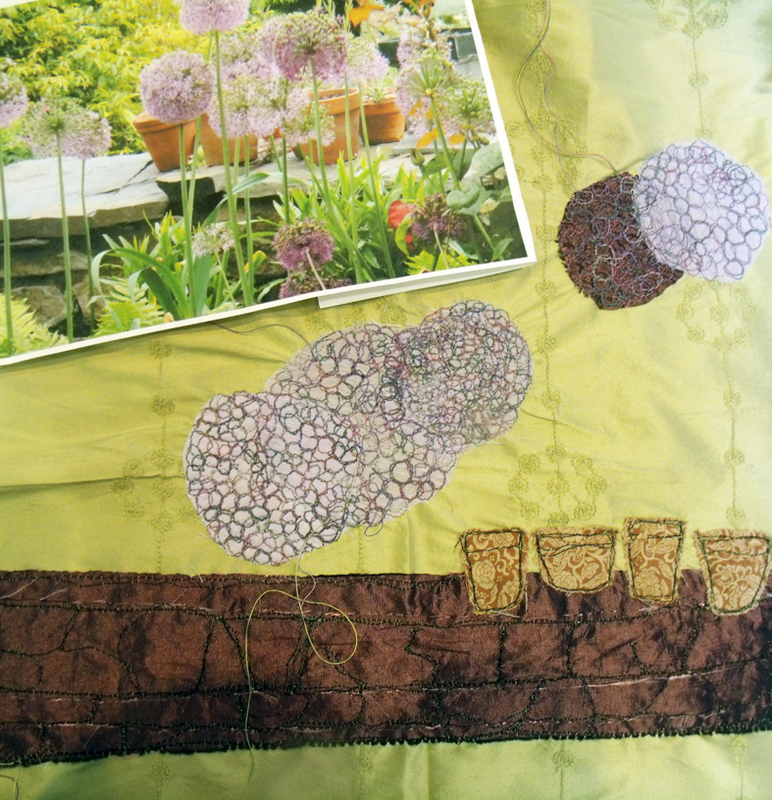 Some more renditions of photographs and cards start to take on a life of their own – this is why I think that copying something inspirational is a good way to start off any new technique, the worry of design is taken away and suddenly invention takes over..
and working from lovely photographs is often a good way to get started – the fabric soon asserts itself. 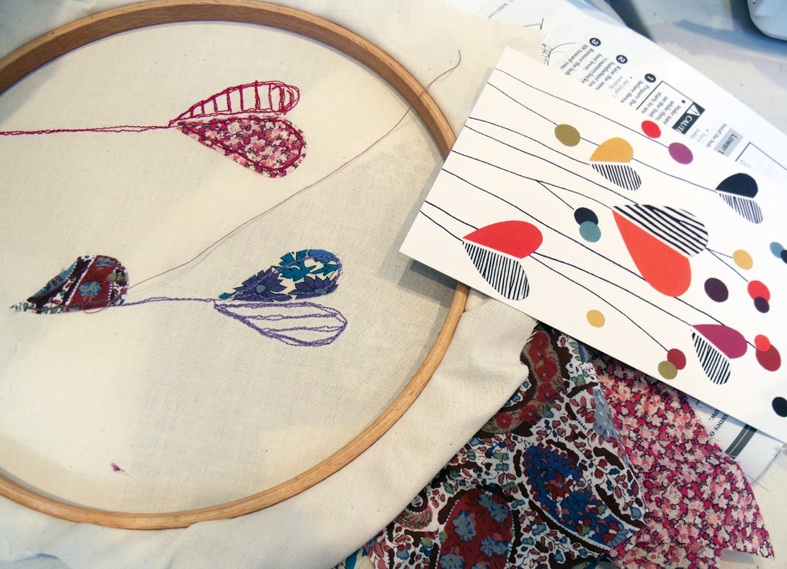 photographic inspiration works for a colour gamut to get things going. 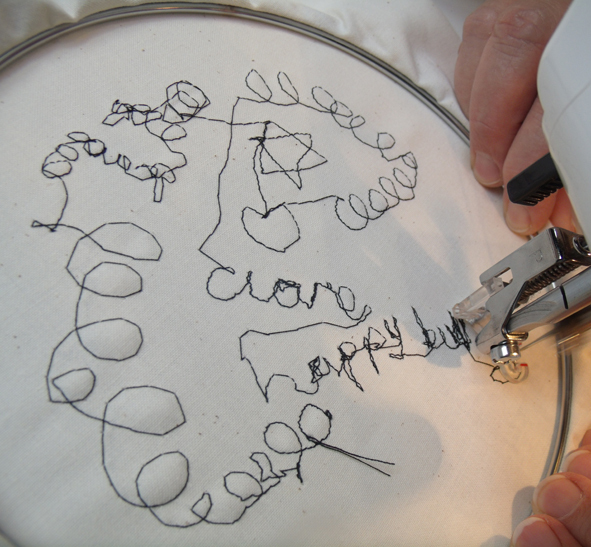 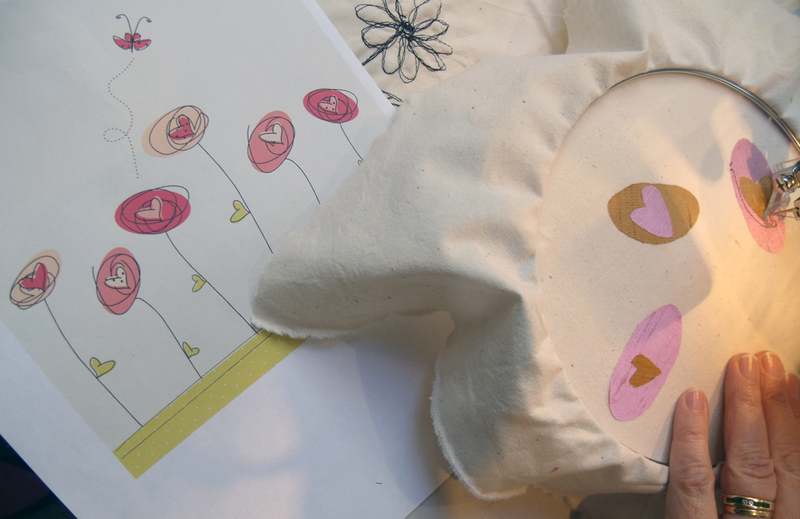 Categories: Drawing, Heart Space Studios, Stitching | Tags: applique, drawing, drawing with a sewing machine, machine embroidery | Permalink.